An epidemic has swept the globe infecting people with a lust for human blood and flesh. While military operations try to contain the losing battle, squads of ex-military patrol abandoned cities and towns to wipe out the monsters lurking in the dark. 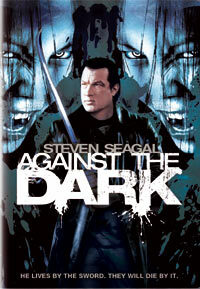 One such team (led by the sword wielding Seagal) enters a huge hospital where at the same time a small group of survivors attempts to escape the infected while trying to find a way out of the labyrinthine building. Somewhat of a cross between 28 Days Later and a survival horror game, unfortunately the lack of pace and originality is this movie’s downfall. The race against time before the designated military bombs hit the area holds little tension. Seagal fans may also leave a tad disappointed as his presence is almost a bit part (occasionally appearing to save the day and slash infected crazies with whispered one-liners). Had it been condensed into a 30 minute short film it would’ve been more effective.